The chart on this page identifies recommended stain removal procedures for some of the most common household spills. These stain removal and cleaning procedures have been carefully developed for use on carpets manufactured with SYNTHETIC CARPET FIBERS ONLY and may not be appropriate for use on any other carpet fibers. 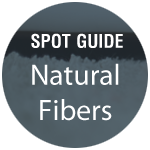 If you would like to view the Natural Fibers Spot Guide click on the badge to the right. Do not use these procedures subsequent to or in combination with other cleaning procedures.THE USE OF NON-APPROVED CLEANING MATERIALS OR PROCEDURES WILL DAMAGE YOUR CARPET AND INVALIDATE YOUR WARRANTY. Call America’s Ultra Clean at 480-964-0007 for assistance. Time and patience are the keys to stain removal. If a spill occurs, immediately try to remove it by blotting with a slightly damp sponge or dry paper towel, followed by repetitive cold water sprays and further blotting with a paper towel. If this procedure fails to remove the stain, follow the procedures outlined below. In the event of a spill, take time to carefully read the following procedures and then follow them thoroughly. Where two procedures are listed (Example A – M), start with the first procedure (A), then use the second procedure (M) only if needed. Repeat procedures as long as there is improvement. The following table lists the most common household Stains. Use this key in relation to the list on the right. then clean to reduce spreading. Procedure A – apply dry cleaning fluid, use dry towel/cloth. Blot-don’t rub. Repeat dry cleaning fluid application as above. Blot-don’t rub. Finish with weighted pad of towels. Procedure B – Scrape or blot up excess spill. Apply detergent (see “Cleaning Solution”), use damp towel. Blot-don’t rub. Apply water – with damp towel. Blot-finish with weighted pad of towels. Procedure D – Scrape or blot up excess spill. Apply detergent (see “Cleaning Solution”), use damp towel. Blot-don’t rub. Apply ammonia (see “Cleaning Solution”), use damp towel. Blot-don’t rub. Apply water – with damp towel. Blot-finish with weighted pad of towels. Apply white vinegar (undiluted), only after stain is removed. Procedure G – Scrape or blot up excess spill. Freeze with ice cubes. Shatter with blunt object such as the back of a spoon. Vacuum chips away before they melt. Procedure L – Apply nail polish remover (non-oily acetone type) – use cotton towel to apply to the spill. Don’t wet through to carpet backing. Pick up softened material – use clean white paper towel and push toward center of the spot to avoid spreading material. Repeat above – soften and carefully remove a layer of the material each time. Haste may spread the stain and/or damage the carpet. Procedure M – Apply detergent (see “Cleaning Solution”), use damp towel. Leave 3 – 5 minutes. Blot – don’t rub. If stain is removed, finish with a water rinse, blot, followed with a pad of weighted paper towels. If stain is not removed, continue as follows. Apply hydrogen peroxide solution (see “Cleaning Solution”), let stand 2 – 3 hours under a weighted sheet of plastic wrap. Repeat application of hydrogen peroxide and dry under weighted plastic wrap until removal is complete. Apply water with damp towel. Blot-finish with weighted pad of paper towels. Apply white vinegar (undiluted), only after stain is removed. Procedure O – Scrape off excess material. Cover with white cotton towel or brown paper. Apply warm iron until material is absorbed. Be sure towel is large enough to cover the stained area. Take care never to touch the iron to the carpet as the fiber may melt. Change towel or rotate to clean area and repeat until all material is absorbed. Procedure P – Vacuum away as much as possible. Loosen remaining material by tapping with a scrub brush or toothbrush. Tap with brush do not scrub. Vacuum again. Follow with procedure “B”. Mix 1/4 teaspoon clear, see-through hand dishwashing detergent with 1 cup warm – not hot – water. Mix 1/2 cup (3% solution available in drug stores) Use within 2 hours of mixing. Liquid non-oily, non-caustic type sold for spot removal from garments (Carbona # 10, Energine, etc) Caution may be flammable.